Along with US/EU/UK/AU/ plugs, our adaptor can be used in for more than 150 countries. Best phone accessory for travel. 1. Covers more than 150 countries with US/EU/UK/AU/ plugs. 2. Compact and lightweight, beautiful atmosphere, easy to carry. 3. Built-in satety shutters protect users from the direct touch of the live parts on the socket outlet. 4. Spare fuse for replacement. 5. Single Plug Safety Feature:Only one plug-type can be used at one time by sliding the knob selection, other plug-pins are locked automatically. 7. 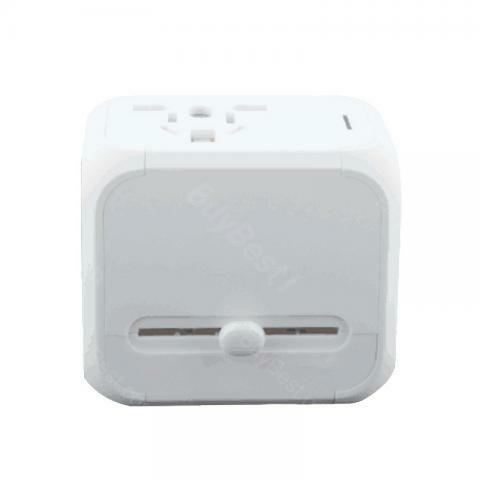 Dual USB Charger for Android and IOS System. Slightly large but they work quite well, and I appreciate the LED to show that it is working and ready for your device. Two USB ports let me charge several devices, I am thoroughly satisfied with this adapter. I bought two of these for a trip overseas and they are fantastic. Slightly large but they work quite well, and I appreciate the LED to show that it is working and ready for your device. Two USB ports let me charge several devices, I am thoroughly satisfied with this adapter. I heard about this fantastic little cheese knife from my brothers fiancé who heard about it from her 80-something Mom who told me! Cheese literally does not stick to this knife! Awesome and it will make a great gift to all my cheese loving friends! Love this charger! Its lightweight anf compact. I can easily carry it in my bag. Plus it has 4 ports! I can charge so many devices at the same time and they all charge fast. Decent price for its function, and it is really cute right?